Iâ€™m about to reveal a little-known Candy Addict secret about myself, something that only my three non-judgmental roommates have become privy to over the course of our mulit-year cohabitation. Late at night, to quell a raging chocolate craving, I have been known to whip up a little chocolate concoction of equal parts cocoa powder, sweetener, and soy milk or yogurt. The resulting creation falls somewhere between a glob and a paste that is not in any way intended for your casual chocolate fan. I then add things to this chocolate crack and eat it with a spoon. (Yeah, that’s right.) 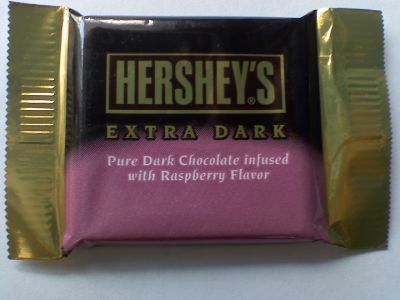 One of my favorite add-ins is frozen raspberries, and it is because of this that I so eagerly dove in to the latest and greatest from Hersheyâ€™s Extra Dark Collection, Hersheyâ€™s Extra Dark infused with Raspberry Flavor. The tasting samples deviate from the traditional Hersheyâ€™s Miniatures rectangular block, instead mimicking the thinner squares of the gourmet pre-packaged chocolate sect. A good choice, in my opinion, as it presents a more pleasing oral experience. The squares, stamped with the Hersheyâ€™s logo, have a pretty strong, natural, raspberry aroma and while the chocolate didnâ€™t boast a great â€œsnap,â€ nor did it bite as hard as Iâ€™d have liked, I am willing to overlook it as that may be attributable to the fact that I enjoyed it on a sunny July afternoon in Southern California. Despite the very specific â€œRaspberry Flavorâ€ name and an utter lack of raspberries in the ingredients list (â€œnatural flavorâ€ is the closest we come), I managed to spot a single bright red speck and a few seeds floating around in the chocolate. The raspberry flavor starts out mild but actually finishes quite strong, marking its conclusion with a mouthful (I kid you not) of raspberry seeds. Now, I like textural complexity in my sweets, but not seeds. It made me feel like I was doing all the work (getting those things out of your teeth is no easy feat), but getting none of the sweet, chewy reward. Seed mouth aside, however, I found the Hersheyâ€™s Extra Dark Chocolate with Raspberry to be pretty good, considering its non-gourmet, 60% cacao origins. I wouldnâ€™t reach for it for a pure dark chocolate fix, but I wouldnâ€™t hesitate if I was looking for that special chocolate raspberry combo. The product is so new that Hersheyâ€™s hasnâ€™t yet posted it on their website, but I learned from Candy Addict insiders that its expected rollout date is December of 2008 (along with quite a few other candies Hershey’s is introducing in ’08), so scooch up to the edge of your seat and be on the lookoutâ€¦ in 5 months. Ok- this review had me laughing out loud when you said you had a “mouthful of raspberry seeds”! I love the combination of raspberry with chocolate so I am anxiously awaiting the debut! I DO THE EXACT SAME THING!! My recipe is a little different, I use evaporated milk, unsweetened chocolate, and powdered sugar. But yes, you are not alone. Whoa! I a sucker for dark chocolates! It is believed that when you eat dark chocolate before an exam it could help in your memory. :) Best of luck! I need to find these. Dark chocolate and raspberry? This is a must eat. is it REAL dark chocolate? Hershey’s doesn’t seem to understand that true dark chocolate means there is no milk involved. i find this very frustrating as a vegan. why, oh why, can’t they make a true dark chocolate pb cup?! by the way, i do a similar chocolate fix. a tofu mousse of sorts (but really good, even if you don’t like the taste of tofu!) it’s fantastic, and lower in fat and sugar than yours: -silken/japanese tofu, pureed, -a lot of cocoa, -sugar/syrup/honey to taste. optional (but way better), melted chocolate. Put it in a blender, add some vanilla extract or alcohol. chill or freeze. …. or spoon straight out of the blender. mmmm.